It’s time to check on the state of your tax information records for vendors. Do you need to get tax ID numbers (TINs) and tax classifications (sole proprietor, partnership, corporation)? How to do it in the 21st century. 02 Nov You Can’t Always Get What You Want – Or Can You? It’s the end of October and there are just two months left in the year. In terms of calendar-related responsibilities, your unclaimed property reporting and escheatment should be done. Now you’re looking towards year-end, and right around that corner, 1099 reporting (with its January 31st deadline). That means it’s time to check on the state of your tax information records for vendors. Do you need to get tax ID numbers (TINs) and tax classifications (sole proprietor, partnership, corporation)? Hopefully this is not a worry. You implemented best practices years ago, requiring right up front a W-9, 8233 or W-8 from every large and small vendor your company engages. And you’ve gotten them. True, you got them on paper forms, but you got them, and they’ve been input into the vendor master file long before the first invoice ever showed up. Congratulations. Of course, every now and then there is the odd purchase made without advanced notice to procurement or payables, and it was not made on a p-card. That one. So yeah, this time of year, it’s necessary to do a check to see that you’ve got a TIN and tax classification for everyone so that when you roll out the 1099s, you’re ready. On the other hand, if this is a reminder that you still do not have a solid process in place and therefore have a lot of TIN gaps to fill, you’re welcome. Go get them — you’ve still got time. Then think about what needs to change in order to avoid the end-of-year scramble for TINs. How is purchasing done at your company? Who’s involved and how do they go about it? Whom do you need to court and persuade to change “the way we do it”? Make a plan for reform and then execute it for the new year. Now think a step further. How do you do this in a 21st century way, so that when you reorder your process and procedure, you not only get what you need — the right tax information form up front — but you get it the way you want, without the hassles of paper, and with automatic alerts built in for documents that expire (you know that W-8s have a shelf-life, right?). So, goal one: Get W-9s, W-8s, 8233s. Goal two: Get those forms served up electronically for you, through a portal method that is easy for you vendors. 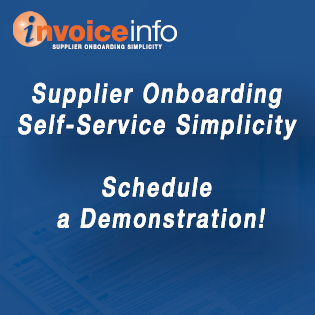 You can onboard new vendors in one convenient location and eliminate paperwork and its associated hassles through VendorInfo’s onboarding and compliance module. VendorInfo can house your new vendor welcome kits, vendor forms, updates to vendor information and more. It includes a wizard to guide your vendors in which IRS tax form they need to submit to you, and then allows them to complete and submit it electronically. In addition, if you have forms that expire, such as a W-8 or an insurance certificate, VendorInfo will notify you that the expiration is coming up. So, at this time of year, remember (with apologies to Mick): You have to get what you need. But if you try sometimes, you just might find — you get what you want! To see how VendorInfo’s onboarding solutions can benefit your operations and your company click here to request more information or call (678) 335-5735.